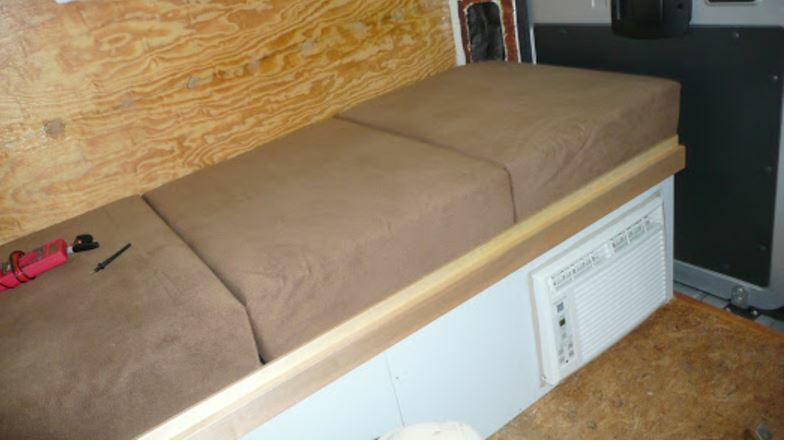 This section goes over several of the options for heating your camper van conversion. Before getting into camper van furnaces, I think its important to talk about insulation. 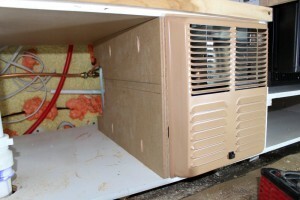 A good insulation job will significantly reduce the size of the heater or furnace you need to heat the van. The smaller furnace will cost less, take up less space, use less heating fuel, and use less electricity — this may translate into a small fuel tank and/or more days without having to refill it and/or a smaller battery pack. More insulation also tends to make the space feel more comfortable with fewer cold drafts. And, more insulation makes the van more comfortable in the summer. For example, on our conversion, the 1 inch of urethane spray insulation plus some simple Reflectix panels for the windows reduces the van heat loss by 80%! 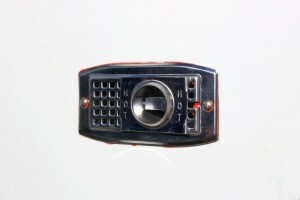 This means that I can easily use the smallest of the RV furnaces to heat the van. End result is a smaller propane tank, and smaller set of house batteries (because the furnace fan is a large electrical load). The insulation also means the van stays cooler on hot days, and can be effectively cooled by running the MaxxFan at low speed. You will want to have some idea what the heat loss is for your camper van so you can select the right size heater. This depends on how big the van is, how well it is insulated, and how cold a weather you want to be able to use it in. This calculator will help you estimate your van’s heat loss. You should include some margin above the calculated heat loss so that the heater does not take too long initially to get the van warmed up. 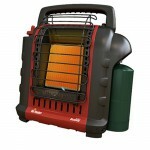 Catalytic heaters are an affordable and efficient way to heat the camper van. 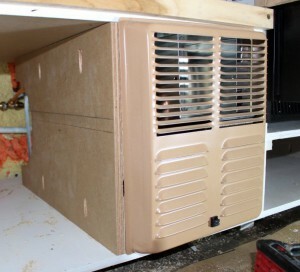 There are built in wall models (that you would mount in a cabinet) and portable models (like the Mr Heater just below). These small, portable heaters run from a 1 lb propane canister, but some can be run from a larger tank via a hose — the tank must be outside the van. These heaters do not vent combustion products to the outside, so ventilation must be provided for safe operation of these heaters. Make sure that the heater you buy has a low oxygen sensor that shuts the heater off when the oxygen level drops to low, and that it has a tip over switch to turn the heater off if it is tipped over. If you use one of these heaters, I would read the manual carefully and follow it to the letter. These heaters also produce some moisture in the air as the propane burns — another reason to provide ventilation. Cost runs $150 or so for the portable heaters and $250 or so for the wall mounted heaters. 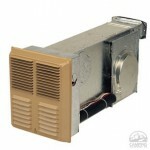 Example brands include Mr. Heater and Camco. 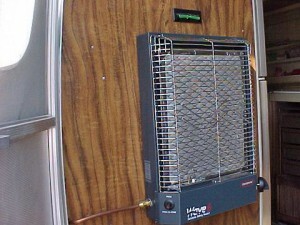 Propane furnaces are probably the most common approach to heating RVs. These furnaces operate much like a home furnace. 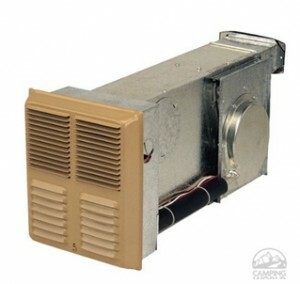 The combustion air is drawn from outside and the combustion products are vented to the outside. If you have any propane burning appliances in the van (or your house), it is important to have an LP gas detector and an CO (Carbon Monoxide) detector in the van. The pictures below show the Atwood furnace we used for our conversion. We used an Atwood 8200 which has 9,100 BTU/hr output and uses about 0.13 gallons of propane per hour when on 100% of the time. This furnace has no air distribution ducts — room air is pulled into the bottom half of the grill and pushed out of the top half. We were concerned that this would make for poor distribution of the heated air, but it has not been a problem. It is controlled by a conventional wall mounted thermostat. I understand that Atwood is no longer offering this furnace, but that there is a similar model. This kind of furnace has to be mounted within a few inches of the wall where the combustion air is to be vented. The furnace is supplied propane from the tank by a 3/8 inch copper pipe using flare fittings. Price wass about $450 for the furnace (it may have gone up some recently) plus a few dollars for the gas plumbing. Atwood furnace installed in galley cabinet. 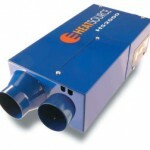 Outside vent for intake of combustion air and exit of combustion fumes. 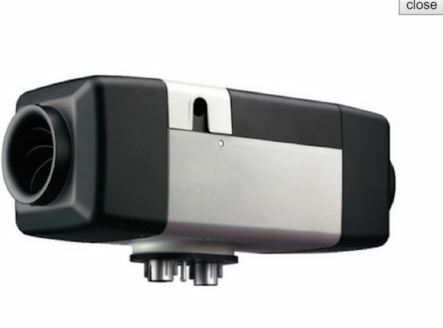 Propex makes a line of compact propane heaters for camper vans. Suburban makes a line of RV furnaces. Diesel furnaces use diesel to fuel the furnace — this gives them the advantage that they can draw their fuel from the vans fuel tank. If the van is not a diesel, then there may be similar gasoline powered furnaces. Webasto makes a line of air heating furnaces called the Air Top — outputs range up to 17,000 BTU/hr for the largest model. It is a very compact unit — about 5 by 5 by 12 inches. Price is north of $2000. The furnace has an altitude sensor that adjusts combustion for altitude, but appears to be limited to elevations up to about 7000 ft.
At least some models of the webasto heaters (eg Air Top 2000 ST) are offered in both a diesel and gasoline model, so you may not need to have a diesel vehicle to use one of these heaters. Webasto also makes a combination water heater and space heater. This appears to be a nice and space saving arrangement — if kind of pricey. Espar also makes a line of popular tuck/RV heaters. They make both air heaters and water heaters. 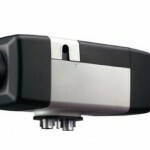 The popular Airtronic air heater comes in several sizes with both diesel (D series) and gasoline (B series). The D2 size air heater appears to go for about $800 with installation kit — the gasoline ones are harder to find, but should be out there. The diesel and gasoline heaters require regular maintenance to take care of carbon particles and other things. There are some reports of fairly high noise levels, so this is something I would look into. There are mufflers available that might help. People have also reported various operational and installation problems — particularly dealing with high altitude use. I would reccommend reading some of the posts on the ProMaster Forum from people who have installed these furnaces. These heaters are compact and take up little space. When installing these so that they draw fuel from the van fuel tank, its a good idea to set up the fuel draw for the furnace far enough above the bottom of the tank so that the furnace cannot empty your fuel tank and leave you stranded. Some vans come with an extra fuel tap for a furnace that is already set up this way. Update 2019: There are now China import versions of some of these heaters available at very low prices. This section has been all about heating, but there are times in the summer when cooling becomes an issue. I plan to adding a full cooling section at some point, but just a few comments now about passive cooling. These things in combination can be pretty effective in keeping the van more comfortable. This is a post on the ProMaster Forum on a test I did on our white, insulated ProMaster van inside temperatures compared to a dark colored SUV parked right next to it on a warm sunny day. Not a highly scientific test, but the difference is so great — the SUV inside was 45F about ambient while the van was within about 6F of ambient. Some folks have worked out a way to add 5000 BTU/hr room air conditioners to their van conversions. This is a very good post on using the 5K BTU units and mounting them in such a way as to be aesthetically pleasing. Photos here… This is also a very inexpensive solution and one that can be run on batteries and solar to some degree.